James Aish battled in the midfield, despite his side falling to Essendon at Victoria Park. Photo: Shane Barrie. Collingwood’s VFL finals hopes have suffered a major blow after falling to Essendon by 14 points on Sunday afternoon. With a three-goal buffer at the three-quarter-time break, the Magpies struggled to contain the fast-finishing Bombers in the final term. The Bombers piled on five goals to Collingwood’s one to run away with the victory at Victoria Park. 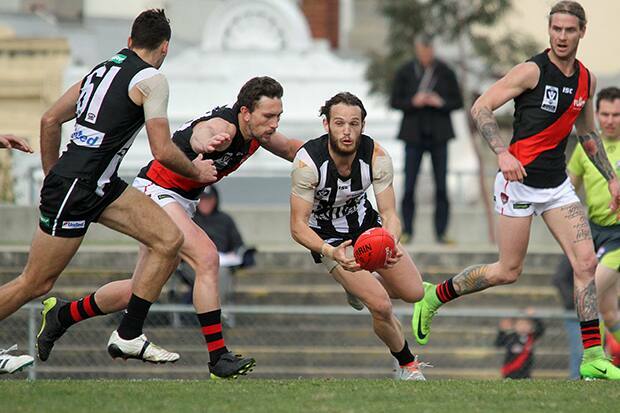 Collingwood midfielder James Aish worked tirelessly in the middle for the home side, while Kayle Kirby impressed with three goals in the forward half. After being named in the extended squad for the senior side, Josh Daicos’ day finished prematurely, as he went down with a foot injury in the first quarter. Defenders Ash Close, Marty Hore and Jackson Ramsay battled for the home side, but it was the senior experience of Bombers Brent Stanton, Shaun McKernan and Aaron Francis that willed the Bombers home. It was a disappointing result for the Magpies, who had a chance to assert themselves in the finals race with a victory today. With only four games remaining, they’ll have to win every game and hope results fall their way to extend their season. Their next challenge comes in the form of Werribee at Etihad Stadium, next Saturday.